Since August 16th 2010, over a hundred GP ex-workers who suffered from excessive levels of Cadmium had started to negotiate with GP in Huizhou. However, GP ignored the workers’ demands and made no concessions. 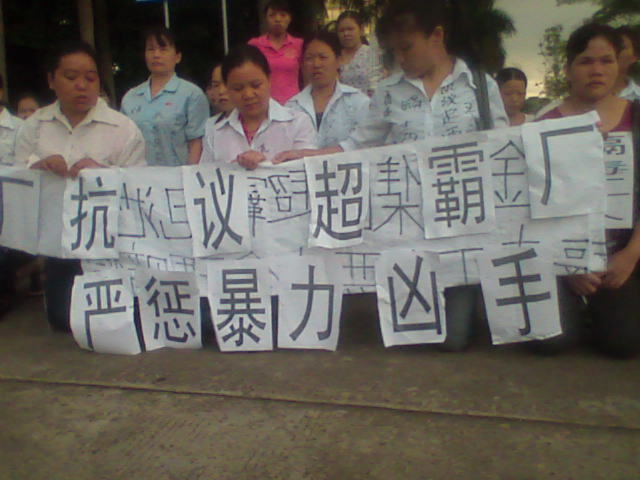 August 24th 2010, over a hundred workers protested outside GP’s factory in Huizhou. On the same day, at around 11: 30 pm, several workers representatives were surrounded and beaten up by about 300 mobs whose identities were unknown. The injured workers include Zhang Xiaoqin, Tan Xiaoqiong, Xian Fang, Yu Shaolan, and Yang Xiaohong. Yu Shaolan was seriously injured, so as Yu shaoian and Xian Fang, and they are all hospitalized at this moment. After the incident, GP refused to pay for the medical expenses. The workers had to raise fund among themselves in order to pay for the hospital bills. In 2004, GP claimed that they would take the responsibility and signed an agreement with us (the workers who suffered from excessive levels of Cadmium), saying that they would take care of us until we fully recovered from the poisoning. We then resigned from our jobs under this promise. Since 2004, our workers’ health conditions had been deteriorating. Up till now, we already had 22 people got poisoned by excessive levels of Cadmium , and there were workers suspected to die from cadmium poisoning. GP broke their promise and forced the workers to accept the so-called “20,000-RMB Agreement”, asking each of the affected workers to take the money and shut up. We refused to sign this unfair agreement, and what happened next was some of the workers’ representatives got violently beaten up. Jet Power in Shenzhen and GP in Huizhou belong to the same company, which is Gold Peak Industrial Ltd. in Hong Kong. Workers form both factories suffered from excessive levels of Cadmium. Jet Power in Shenzhen closed down recently, but the compensation offered to the affected workers by Jet Power was far better than us. Each of them received about 15,000 RMB allowance in total, and an extra300 RMB each month as nutrition fee (until their body check becomes normal again). However, the workers in Huizhou never got the same treatment, and when we left the factory in 2004, we did not receive the same allowance. The actions we had been putting up these few days were aimed to fight for the same treatment for the workers in Huizhou by GP. Who is behind the scene of this violence incident? It is obvious that this violence incident was pre-arranged by somebody. The most shocking thing is: who could recruit 300 mobs to beat up workers in 3 hours, and how did they know which ones were the workers’ representatives? The mobs told us that they were paid 50 dollars a day to beat up the protesting workers. Some workers even saw that there were two security guards bringing these mobs to beat us. We feel extreme angry, and we strongly oppose the use of violence against protesting workers. We think the government and GP did not take their responsibility to protect the workers, because the incident happened when the workers were negotiating with the factory, under the government’s coordination. We strongly urge the government to immediately investigate this violence incident and to arrest the offenders and the people who arranged this incident. Moreover, GP should compensate the injured workers and cover all related medical expenses. We urge the society to support out reasonable demands and our fight for justice.